We have all heard the old adage—“The 3 most important things about real estate—location, location, location”. There is a lot of truth to this statement! However, a lot of investors make the mistake of assuming that a NICER location necessarily means a MORE PROFITABLE location. That is most certainly not always the case—and I would like to explain how we believe that right now, in Jacksonville, the opposite is actually true. Everyone in real estate recognizes that when it comes to rental properties, you get a better rental yield from lower priced properties, because rents don’t rise in lockstep with home prices. For instance, while a $100,000 house might rent for $1,000/month, a $200,000 house in the same region isn’t going to rent for $2,000/month. It will probably rent for about $1,400-$1,600/month. This fact holds pretty consistently across the entire country. However, another assumption that most people make—which we currently believe to be inaccurate—is that properties in more desirable areas will always appreciate at a faster rate than properties in less desirable areas. As I have traveled the country the past couple years speaking at real estate conferences, this was an assumption that I heard a lot of investors—some of them very large investors—making. In a normal market, that might possibly be the case. However, the real estate market hasn’t been “normal” for almost 15 years now! The crash, and current recovery from the crash, are still having a huge impact on home prices that investors can take advantage of if they understand them. In order to help understand them we have to make it easy to differentiate among “more desirable” and “less desirable” areas. This is normally done by splitting a geographical area up into different much smaller like neighborhoods and labeling them A, B, C, and D. A is better than B, which is better than C, etc. The definition of what constitutes an A, B, C, or D neighborhood is fairly subjective (and more of an art than a science) because the data around home prices can be greatly influenced by age of homes, % of distressed homes, average square feet of homes in the area, etc. However, for VERY general purposes, an A market should have a median price per square foot ($/sqft) of ~120% of median, a B market should have a $/sqft of 80-120% of median, a C area should have a $/sqft of 40-80% of median, and a D market should have a $/sqft of less than 40% of median. If you want to know what are the A, B, C, D areas in your market—look at the data to have a general idea, and then ask ten real estate investors. Go with the majority opinion! As you all know, JWB invests in the B and C areas. That is where we feel we get the best balance of great cash flow, good quality of tenant, safety for our staff and our residents, and potential appreciation upside. Of course, the best place to invest in is a C or D area that is becoming an A area! This improving of an area can happen through municipal investment, a new shopping center opening, gentrification, etc. However, that changing of a neighborhood is hard to predict, and for the purposes of this article we are just going to be assuming that the areas themselves aren’t changing—an A will stay an A, and so on. 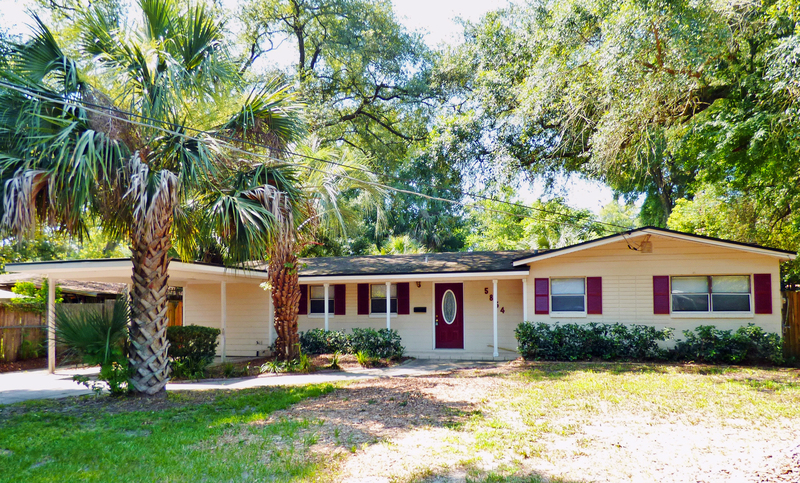 This JWB home is located in a “C” neighborhood in Jacksonville, a typical area JWB invests in. So what has been the impact from the crash on home prices in the various different areas, how has each of the different areas recovered, and how does it affect you as a real estate investor? Look at the chart on the front page. This chart is showing current $/sqft in the different neighborhood ratings of Jacksonville (A,B,C,D) and comparing them with the median home price of those areas in 2004 and 2006. For instance, the median $/sqft in the D areas of Jacksonville is currently $22.40/sqft. In 2006, it was $74.60/sqft. The 2015 price has a 70.02% discount to the 2006 price ((74.6-22.4)/74.6). That’s 70 percent! From this chart, it is easy to see that the A areas have recovered MUCH faster than the rest of the areas and it goes down the line. B has recovered more than C, which has recovered more than D. The reason for this isn’t rocket science. When the prices of homes fall, and just about everywhere is affordable, a home buyer (investor or owner occupant) is naturally going to get a house in the nicest area they can afford. From 2010-2014, has been the A areas. However, now that the A areas have almost fully recovered in price—they are 1% below their 2004 pricing and 13% below their 2006 pricing—the average home buyer can’t afford those areas any more. So if that homebuyer wants to buy a house, they have to go to the next best area they can afford—the B areas—which increases demand in those areas, which will raise prices. We are already starting to see that in Jacksonville, with some B areas seeing double digit appreciation over the past year. And then it goes down the line—after the B areas recover, the C areas recover, etc. Another factor that is influencing the slower recovery of the less desirable areas is that there were more foreclosures in those areas, which are negatively impacting home prices. With only a few years (between 1-3 years, from our estimation) of foreclosure inventory left, the negative influence of those foreclosures will dissipate at some point in the future, which will certainly raise home prices in those areas as well. A saying we use to describe this phenomenon is “all boats rise with the tide—but it takes longer for the tide to reach certain harbors.” The A areas had a quick jump in value first (20-30%)—and they have now leveled out, and should see “normal” (3-5%) appreciation going forward. Now, over the next few years, the B, C, and even D areas of Jacksonville should see a jump in prices as the market returns to “normal”. So right now, JWB believes that the B and C areas are going to see HIGHER appreciation than the A areas over the next few years. And we already know the B and C areas get better cash flows than the A areas. Therefore it seems pretty clear—the old adage of “location, location, location” still holds true—but, at least for the near term, the most desirable areas aren’t the best location to be investing in! Talk to one of our investment specialists to learn more about our Jacksonville turnkey cash flow properties.